One of the companies sharing its marine industry talents in the restoration of Canada&apos;s iconic tall ship Bluenose II will soon use that expertise to help re-create one of the famed schooner&apos;s greatest rivals. Covey Island Boatworks of Lunenburg, Nova Scotia, said it will provide all 10 of the spars, standing and running rigging, mast hoops and rig metal work for the schooner Columbia, a replica of the 140-foot schooner that sailed out of Gloucester, Mass., in the 1920s. “This vessel, and its historic connection to the Fishermen&apos;s Cup Races, to the Bluenose and so to Lunenburg, makes it an honor for our company to have been chosen,” Covey Island Boatworks president John Steele said. The Eastern Shipbuilding Group, based in Panama City, Fla., is building the replica schooner Columbia. 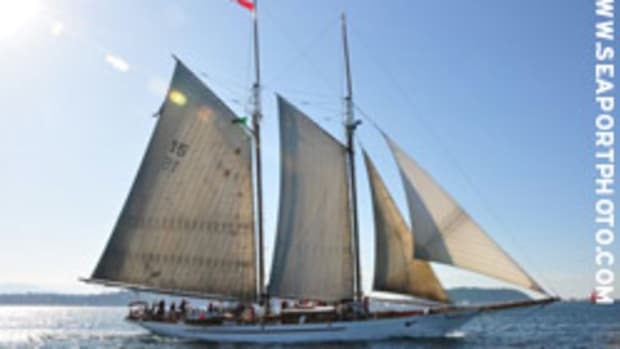 Angus Walters, who captained Bluenose during the heady days of schooner racing, said Columbia was the best fishing schooner that Americans ever produced. The legacy of the original Columbia, however, was unexpectedly cut short when it was lost off Nova Scotia during the August Gale of 1927, with all hands.